Coffee Hall is a very green place, surrounded by green grass, a lot of cherry trees, a lot of horse chestnut trees, gardens with rose plants of many kinds and different kind of berry bushes by the footpaths. Coffee Hall is situated away from the main roads. There is hardly any noise from the heavier traffic. There are very good car parking spaces. Each house has two or three spaces and even more. There are redway footpaths all over, which lead out of the estate to the other parts of the residential area, to go over or under the the roads. Coffee Hall has fully accessible facilities. Its location is accessible by public transport, and it is situated within walking distance of Eaglestone, Bleak Hall, Beanhill and Oldbrook estates. The general environment in Coffee Hall is very good all-around. Houses: The grid square is split in two with, at first, the northern section being developed mainly for education and the southern for the residential housing area. Now they have schools and housing in both areas. In the southern section there are detached houses, one and two storey buildings and terraced houses. Chapter House was built for housing to accommodate young single people. 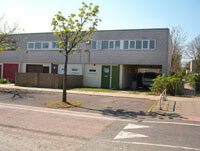 There is also a sheltered housing scheme for the old people. Schools: There are four local schools. The first school is Cornhill School, for ages 4 to 8 years old. The Middle school, Copperfield is for ages 8 to 12 years old. There is a Catholic School, St Paul’s for ages 8 to 19 years old. The Upper school, Sir Frank Markham for ages 12 to 18 years old, is in the Northern section of the estate which is in Leaden Hall. Churches: There are two churches. One is called Christ the Divine Church. This was once a pub, The Walnut, which was revamped when it became a church. The other church is called Our Lady Of Lourdes Church. The church is always full on Sunday during the time of mass. Shops:The shops are placed in the centre of Coffee Hall. There is a community centre,a meeting place, a fish and chip shop, a Chinese Take Away, a Chinese grocery food shop and a small supermarket. The Arts Workshop: The Arts Workshop is behind the local shop. They used to have different lots of art related things to do. They have courses for adults and children and also produced art outdoors.